Route optimization models reduce the overall number of kilometers driven by each snowplow driver. The city has unlimited access to ArcGIS software and its extensions through an Esri enterprise license agreement. GIS helps determine when and how a roadway should be plowed and what type of vehicle should be used. John III, Duke of Finland and son of King Gustav I of Sweden, founded Pori in the Grand Duchy of Finland in 1558. Located at the mouth of the Kokemäenjoki River, the settlement was to serve as a harbor and market town to revitalize trade with continental Europe. Pori was originally populated with approximately 300 residents who relocated from the nearby town of Ulvila. The new city quickly became commercially successful, and Pori prospered as a regional center for commerce and shipbuilding. Location allocation optimized snowplowing zones for pedestrian walkways. Today, Pori has nearly 84,000 residents who enjoy a high standard of living. The city is home to three universities, and the Pori Jazz Festival is one of the best-known music festivals in Europe. Because of Pori’s location in northern Europe, snow cover in the city lasts more than one-third of the year. Snowstorms can start as early as October and last into late April. During this time, city workers must keep 1,163 kilometers (723 miles) of streets and 295 kilometers (184 miles) of bicycle paths free of snow and ice. Pori’s public works department is a longtime user of GIS software, primarily for asset management and infrastructure maintenance projects. However, snowplowing operations were traditionally managed on a large wall map that detailed the city’s service areas. Supervisors dispatched drivers to plow streets and bicycle paths in the service areas in the same way they had been plowed for the past few decades. That is, the supervisors assigned the drivers to successively plow and replow each area during the winter without any consideration of how the routes and snowplowing service might be optimized. In early 2012, Pori entered into an enterprise license agreement with Esri, which allowed the city unlimited access to ArcGIS software and its extensions, including ArcGIS Network Analyst. With greater access to GIS for city employees, Widbom teamed with Aki Kaapro, GIS analyst at Esri Finland Oy, Esri’s authorized distributor in Finland, to build geoprocessing models to facilitate snowplowing and provide access to the geodatabase for those public works employees involved in snow clearance. First, they had to collect specific data on the existing roads in the city. To do this, the entire city was divided into approximately 800 grids, each measuring one square kilometer. All roads and paths within each grid were then visually inspected and categorized. While the city’s pavement department maintains the road network in its GIS, there was little information on street care classifications, such as the amount of accumulated snow allowed on a specified roadway before it should be plowed. Street care classifications also include a road’s width and its topology, which can affect the snow buildup and the way that the road is plowed. It took more than a year to collect all the required data. Three examples of optimized snowplowing routes on pedestrian streets. When the categorization of the city’s roads and bike paths was complete, Kaapro began to develop the two geoprocessing models. One determines the optimal snowplowing areas, and the other optimizes the routes to and through those areas. The models use a number of factors, including the data previously collected in the inspection of the city’s streets and bike paths, street maintenance priority classifications, the type of snowplow vehicle required, and the total number of areas to plow. 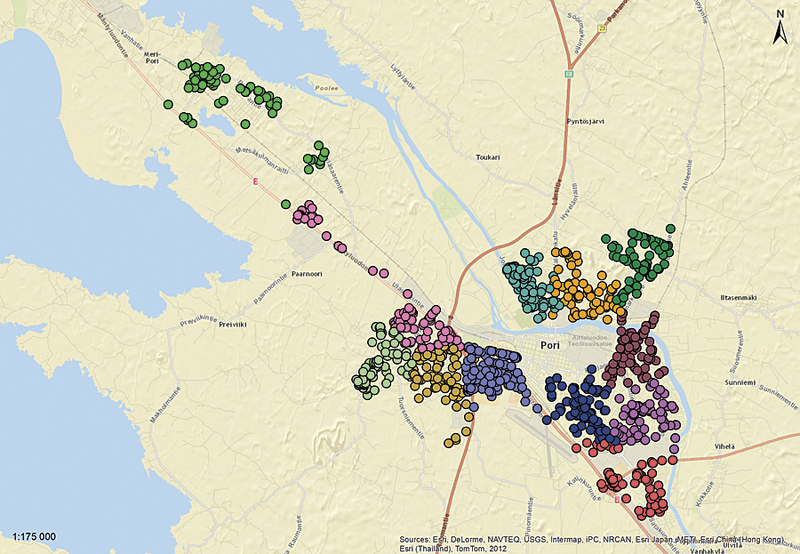 The first model uses the Location Allocation tool in Network Analyst to create demand points on those areas where snowplow service is required. 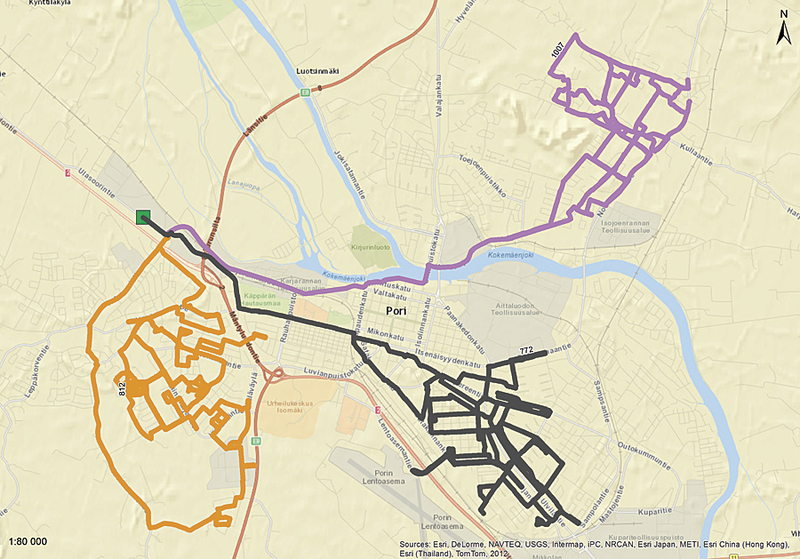 After the demand points have been determined, the second model uses the Network Analyst vehicle routing problem solver to find the optimal routes to service and plow them. The model also allows multipoint routing and route reordering. Widbom has received a positive response from the drivers and their supervisors in the Pori public works department and plans to expand the implementation of the models’ results during this year’s winter season. In the future, he would like to make the city’s geodatabase available on smartphones so that drivers can interact with the routing assignments from the field and review route history, if needed. For more information, contact Timo Widbom, GIS specialist, City of Pori.